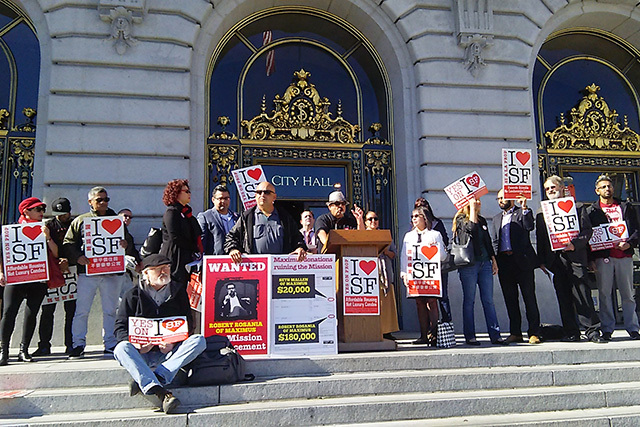 Though the Mission moratorium was voted down on Tuesday, San Francisco progressives are renewing their dedication to stalling market-rate housing in the Mission and in other neighborhoods. Indeed, at a post-election talk at non-profit and urban development think tank SPUR the same afternoon, political analyst David Latterman showed heat maps of yes and no votes on individual measures by precinct, and large swathes of the Mission supported the moratorium – though not, he said, by as large a margin as he had expected. The analyst worked on Supervisor Julie Christensen’s campaign and did some work for the “No on I” campaign. Watching the numbers, he said support for the moratorium fell in the last few weeks before the election. But co-presenter Alex Clemens, founder of Barbary Coast Consulting, said San Francisco’s housing crisis would continue to heavily influence politics. As a result, he said he expected to see more land-use ballot measures in the future. “There will be more moratoria, plural, because of the narrative in this town. There are going to be a lot of people figuring out how to be closer to 50 [percent] than they got this round. These battles are probably not over,” Clemens said. Though they did not formally announce plans for a moratorium comeback, Proposition I supporters said at a press conference Wednesday morning that they would continue their efforts to stall market-rate development, both by opposing individual developments and working on legislative change. “We will fight every single luxury development with you and we will fight every eviction,” promised Chirag Bhakta, a Tenderloin resident and activist with various Mission groups opposing market-rate development. “We will go back to make sure that we crush the ‘Monster in the Mission,’ go back to beat down the ‘Beast on Bryant,’” neighborhood organizer Roberto Hernandez promised, using the nicknames market-rate housing opponents have assigned to major developments on 16th and Mission streets by Maximus Real Estate Partners and on Bryant Street by Nick Podell. He started right then and there by revealing the opposition’s nickname for a development planned for South Van Ness by Lennar Urban, dubbing it “The Titanic Mess on South Van Ness.” It joins the “Fright on Folsom” by Axis Development on Folsom and 23rd to round out the upcoming targets of Mission housing advocates. “Come next June and November, they will be doing the same thing in the Bayview and in the Richmond,” MEDA’s Granados said. Activists from those neighborhoods echoed him, saying they planned to stand with the Mission and maybe even start luxury housing moratoria of their own. “You should count on us being here again in June and November,” he added. “The dormant giant became alive and we have taken the first steps, and we’re not stopping here,” said Sam Ruiz, executive director of the non-profit Mission Neighborhood Centers. My bet is on the PLAY GROUND for the rich prevailing…….. Same old tired poop from the same old tired Latino/Mission Inc leaders. How soon before Gabriel Medina announces he running for Avalos’ seat? We today saw Edwin Lindo toss his sombrero into the ring to win the Mission District seat next year. I don’t trust any these dudes or any of the folks from Save the Mission/Plaza 16/Homeless Inc/Housing Inc/Progressive Inc.
They’ve all permitted David Campos to be a slouch on the BOS and as the eviction epidemic was starting to rage, not a peep of protest or hearing from Campos until too late. Where was the pressure put on him to curb the developer greed, before he took Veda money? But as too often happens in SF, all the energy was shoe-horned into electoral politics, something progressive in this town are terrible at. As the year ends, Plaza 16 and friends have a monumental electoral loss on their hands. Don’t expect me to buy anyone peddling the b.s. that last night’s loss was a win for the Mission because the vote was over 40 percent for Prop I. Yawn, another presser from these folks on the steps of City Hall. Get real already. David Campos did not take money from the Veda developers. He was a middle man between GOD and Veda.,He took the Veda cash and threw it in the air and said “god you can have as much money as you like and whatever falls on the ground is mine” God gave it to David Campos not Veda developers. David Campos is a man of the people and for the people. Love not war….. homes not profits.